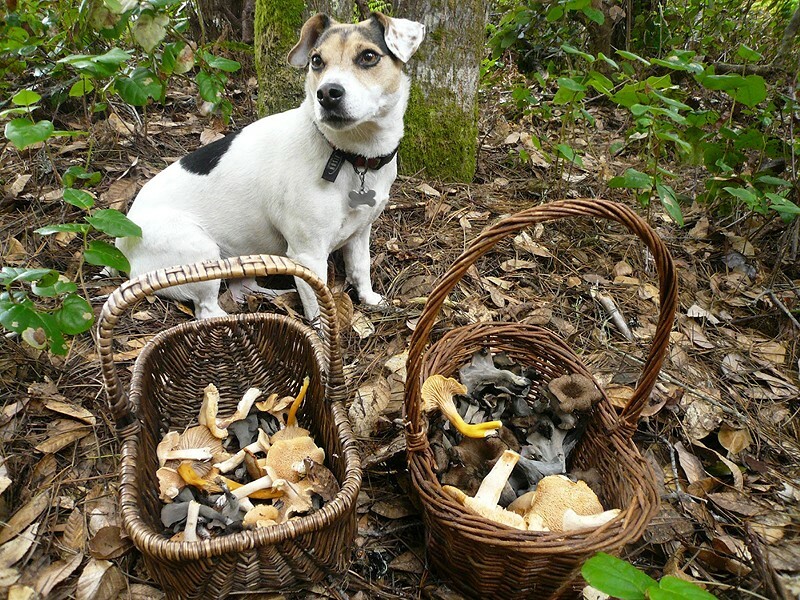 Photo by Kevin Smith Abalone, the author's mushroom-hunting dog, with the harvest. 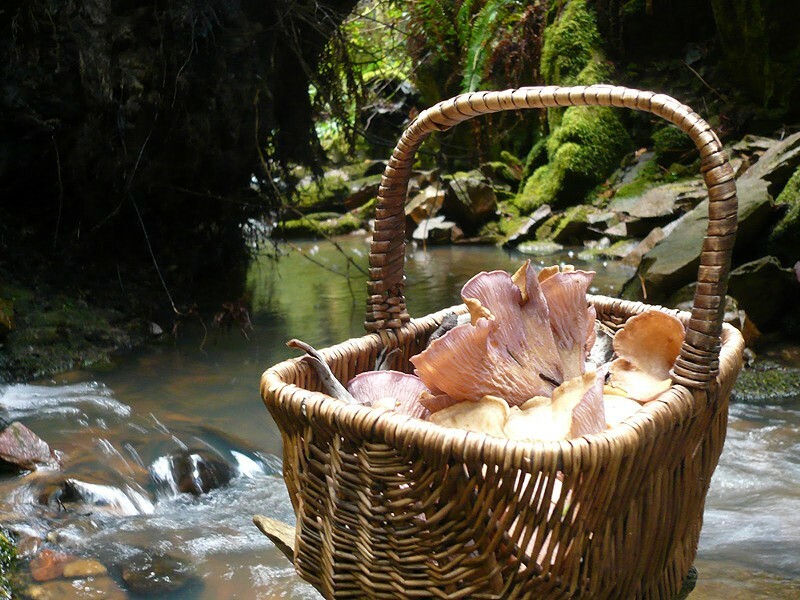 The frequent rain and heavy fog of autumn and winter on the North Coast brings an astounding abundance of edible fungi. From chanterelles to oysters, hedgehogs to boletes, there are more goodies in the woods than we know what to do with. Like many Americans, I grew up with a fungi-phobic mindset. Unlike many cultures, the general perspective in the U.S. seems to be that eating wild mushrooms is like playing Russian roulette. Misconceptions by those entirely ignorant of, or at least inexperienced in, fungi identification are supported by a few cases of misidentification and the occasional poisoning. I am not saying that wild mushrooms cannot be toxic, that poisonous look-alikes do not exist or that some wild mushrooms can't absolutely end your life — BECAUSE THEY CAN. What I am saying is that with a little experience, many edible local fungi can be safely harvested by the average Joe or Jane and cooked up into exquisite meals. Have you ever enjoyed chanterelles and caramelized onions sautéed and served over a filet mignon at a fine restaurant? Well then, you should know that golden chanterelles (Cantharellus cibarius) are impossible to cultivate. The mushrooms you ate came from a mushroom hunter relying on experience, skill and pattern recognition to accurately distinguish this species from the inedible scaly chanterelle and poisonous false chanterelle before it ever reached the grocer, the chef and, finally, your plate. So, why would you willingly rely on a stranger to be sure you are not about to ingest poison? Well, luckily for us, distinguishing the aforementioned species is not rocket science and you should absolutely not pass up a meal made with local chanterelles — ever. That said, why not get out in the woods and learn to identify and harvest a wild bounty of fresh fungi for your own table? To begin, I cannot encourage you enough to seek out a local mycological society, like the Humboldt Bay Mycological Society (hbmycologicalsociety.org) and join one of its seasonal outings. The connections you will make with fellow fungi enthusiasts are priceless and it gives the amateur ample opportunities to learn from those with more experience. However, my own rule No. 1 is never let anyone identify your mushrooms for you in the field. To be sure, always key mushrooms out for yourself and be 100 percent positive of your identification before you even think of eating a wild mushroom. Which brings us to the books. My two favorite books on the market for identifying wild mushrooms of North America are Mushrooms Demystified and All that the Rain Promises and More, both by David Aurora. Amateur mushroom hunters should pick up both books but at the very least start with the latter. All That the Rain Promises and More is the "hip pocket guide" to many edible (and some toxic) species in our area. The book contains a detailed key that allows any mushroom hunter to match a suite of attributes to a particular species to determine whether it is edible or dangerous. The book also contains detailed information about where each species might be found. So study your trees, as many mushrooms only like to grow under specific species. There are certain species of fungi that will be easier for beginner mushroom hunters to safely identify than others. 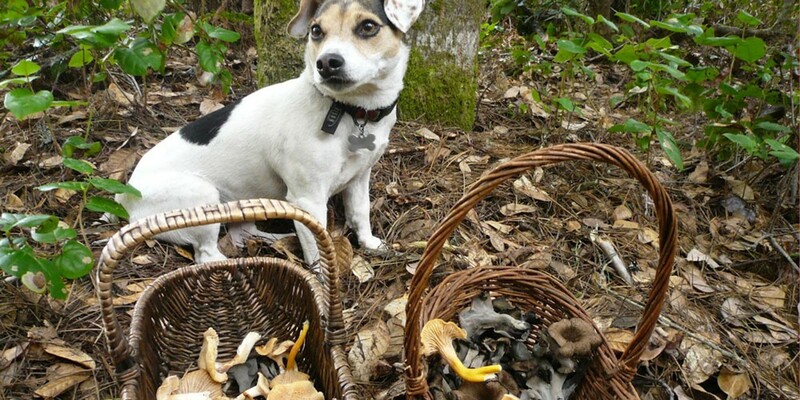 I recommend beginning with the chanterelles (including golden chanterelles, black trumpets and yellowfoot or winter chanterelles), hedgehogs, puffballs, oyster mushrooms, king boletes, bear's heads, lion's manes and cauliflower mushrooms. The last three may be a bit more difficult to find in the beginning but once you locate one, it's worth it. All of these species are absolutely delicious and will make incredible additions to any seasonal meal. You can also dry many species to have a supply of edible fungi throughout the year. So if you get into it, a food dehydrator is a worthwhile investment. Mushroom hunting is like an Easter egg hunt for adults. But honestly, kids love it too. There is no better wintertime activity in the woods, with so much potential to bring the whole family together. I have seen folks in their 60s on hands and knees crawling under huckleberry bushes giggling at the sight of a full flush of hedgehogs. Friends in their 20s and 30s can't get enough of it and my buddy Jeremy's daughter is under 10 years old and one of the best locators of oyster mushrooms around. It doesn't matter if you were raised in the country or city, mushroom hunting is sure to bring a smile to your face. Fair warning though, if you start you will almost certainly get hooked on the first outing. A few final tips: Locating the proper area to enjoy a wild fungi hunt may take a bit of research and even a bit of restraint. Please avoid trespassing on private land even if you see a full flush of king boletes just a few yards beyond that barbed wire. You'll need a free permit (for personal use up to 5 pounds per day) from the Bureau of Land Management to hunt on public land. Call the Arcata field office (1695 Heindon Road) at 825-2300 to find out which areas and what tools are permitted so as not to damage the forest environment. There are plenty of locations open to public mushroom hunting and with a bit of asking around you can find some incredible secret spots. When I say secret, I mean secret — if a friend shares a location with you, it is part of the mushroom hunter's code that you are now sworn to secrecy about that exact location. ALWAYS be positive of your identification in the field and re-identify fungi in the kitchen as you brush your harvest clean of dirt and duff. Finally, for a great date, bring a little camp stove, some chevre, olive oil, herbs, onion, balsamic vinegar, butter and French bread along. Brown a few slices of a sourdough baguette in olive oil to make a quick crostini, spread with chevre, top with sautéed herb-butter fungi and a dash of vinegar. This little snack will surely wow someone new or even a love you've known for decades. Oh yeah, and bring some hot chocolate for the rainy days — everyone likes that. Happy hunting and don't eat anything I wouldn't eat!